The PSP E27 is modeled after the famous analog equalizer E27 produced by Avedis Audio Electronics. It is on promo for just four days at the no-brainer price of $39.99 ! 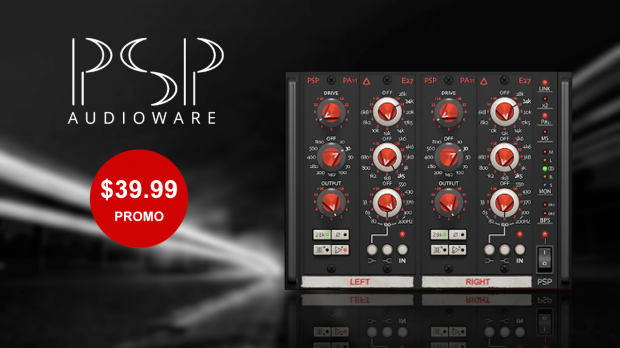 PSP E27 SE (included in the bundle) is a simplified version of PSP E27, our multistage equalizer plug-in modelled after the analog E27 produced by Avedis Audio Electronics. The PSP E27se is based on the same great audio engine, but it has a redesigned, simpler GUI making quick adjustments a snap. The PSP E27 is equipped with one E27 and one PA11 module. It’s perfect for both mono tracks and stereo stereo in which you don’t need seperate settings for the Left and Right channels. This entry was posted in Audio Software, DontCrack, Plug-ins, Promotions and tagged Avedis Audio Electronics, Equalizer plug-in, multistage equalizer plug-in, PSP, PSP Audioware, PSP E27. Bookmark the permalink.